An interesting example of media censorship recently appeared in Israel. 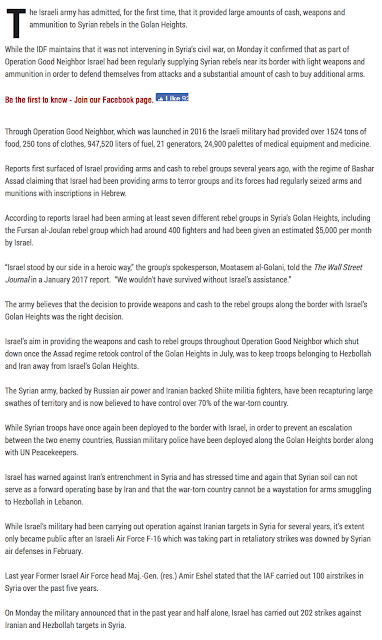 At 18:00 hours on September 4th, 2018, the Jerusalem Post published an article discussing part of the Israel Defense Forces’ operations in the Golan Heights region. 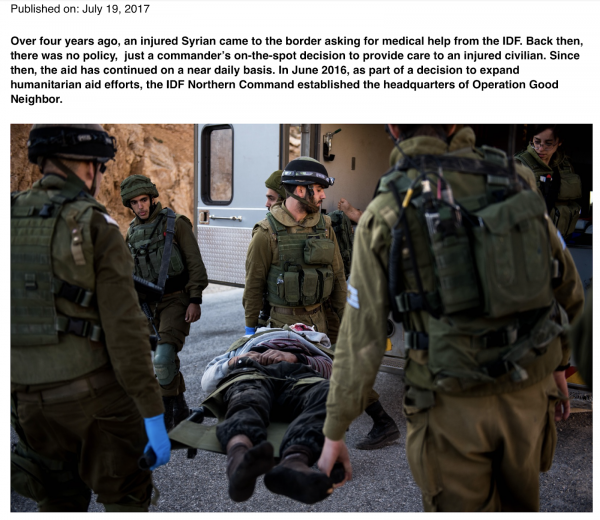 These actions were allegedly part of the IDF’s Operation Good Neighbor, a non-confrontational operation of Israel with the goal of helping Syrian citizens caught in their nation’s civil war. 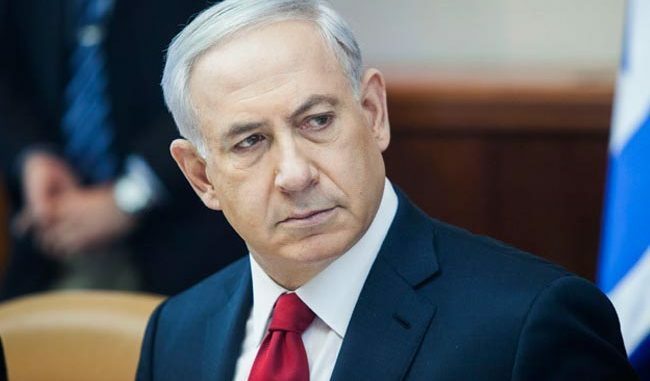 “The goal of Operation Good Neighbor is to provide humanitarian aid to as many people as possible while maintaining Israel’s policy of non-involvement in the conflict. The first activities coordinated by the headquarters took place in August 2016. Since then, there have been more than 110 aid operations of various kinds. 1. Medical – Over 4,000 people have been brought to Israel to receive treatment, including hundreds of children. 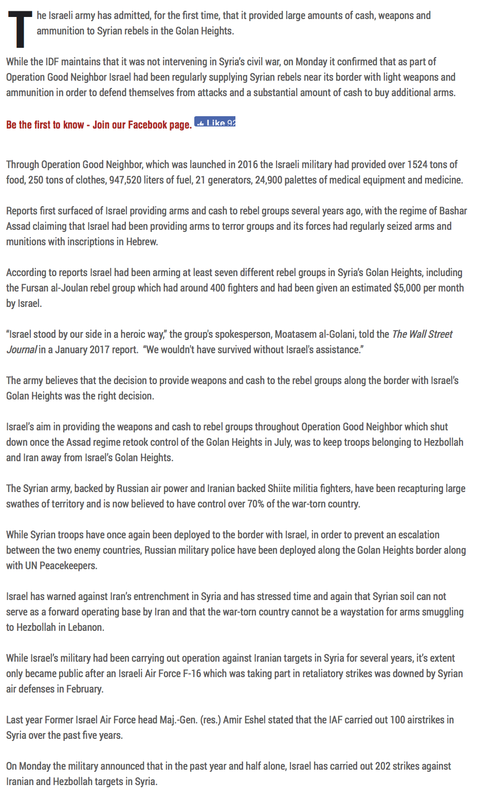 The IDF also transfers medicine, supplies, and equipment to Syrians across the border. An internationally managed field hospital has also been established at an Israeli outpost near the border. 2. Infrastructure – 450,000 liters of fuel have been transferred for heating, operating water wells, and ovens in bakeries. The IDF also transferred seven generators, water pipes to rebuild Syrian infrastructure, and equipment for a temporary school in the region. 3. Civilian aid – The IDF transferred 40 tons of flour to bakeries, 225 tons of food, 12,000 packages of baby formula, 1,800 packages of diapers, 12 tons of shoes, and 55 tons of cold weather clothing. The most important thing to note about the IDF’s operation is that it is to “.…maintain Israel’s policy of non-involvement in the conflict” and that the only things supplied by Israel are for medical, infrastructure and food/clothing needs. As you will see in this posting, this is not particularly accurate. Let’s go back to the recent article in the Jerusalem Post. 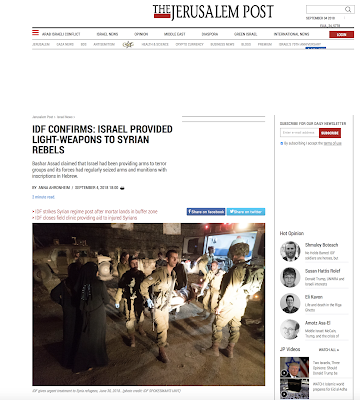 The article entitled “IDF Confirms: Israel Provided Light-Weapons to Syrian Rebels”claims that the Israel Defense Force had supplied weapons, ammunition and cash to at least seven different rebel groups located in Syria’s Golan Heights Heights prior to the Assad regime retaking control of the Golan in July. It is also interesting to note that absolutely no other mainstream media outlet has covered this story with the notable exception of RT, the dreaded Russian state-owned media outlet. 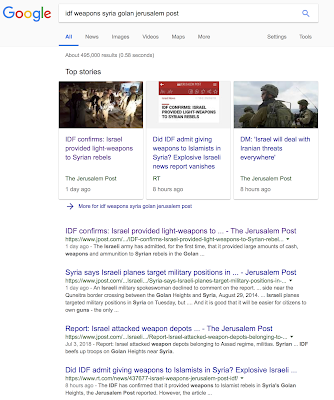 That said, according to RT, the original Jerusalem Post story was pulled by the newspaper at the request of the IDF’s military censor for security reasons. 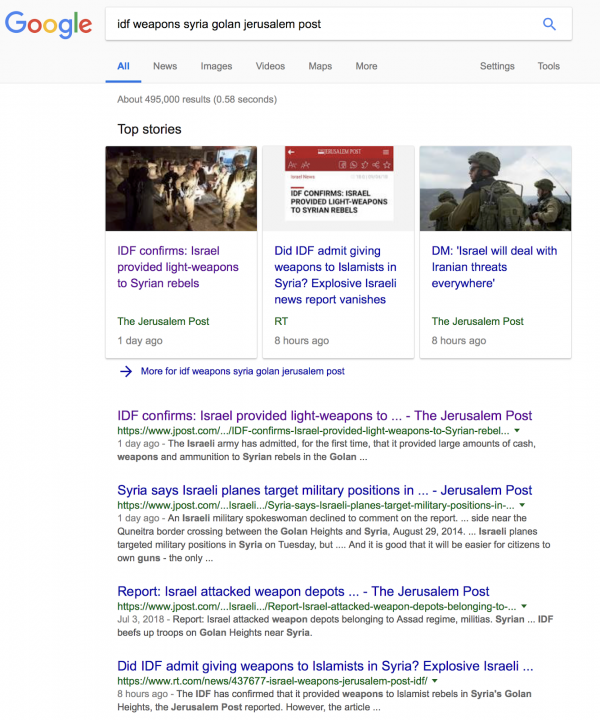 While it must be heart-breaking for Israel’s leadership to see Syrian government forces retaking territory and the democratically elected Assad government reestablishing its control over a nation that, three years ago, seemed close to collapse, it is most interesting to see how Israel’s armed forces has control over Israel’s media, using its power to kill a domestic story that wasn’t in its best interests and one that goes against the narrative of its alleged “Good Samaritan” program in the Golan.